Sofia Khan has had it with men. She thought she'd found the one, but it turned out he wanted her to move in with his parents (sort of, next door but with a hole connecting the two houses) after they got married, so now Sofia has given up. Or she thinks she has - when she accidentally pitches a book about Muslim dating to her boss, Sofia finds herself having to examine love, life, family, and go on a few weird dates all in the name of research. Ayisha Malik's Sofia Khan is Not Obliged is brilliantly funny, and put me immediately in mind of Bridget Jones, albeit a more up-to-date version with a Muslim protagonist. Malik's book is full of fun, and if I wasn't smiling with Sofia, I was usually laughing with her. The first truly laugh out loud moment came just pages in, when Sofia, after being called a terrorist by a Tube passenger, leans out the doors to shout: "Terrorists don't wear vintage shoes, you ignorant wanker!" It's the kind of comeback that is both clever and a bit silly, and Sofia Khan is Not Obliged strikes a balance for its protagonist between both those qualities. Sofia Khan is Not Obliged is a love story at heart, but not just one about romantic love (although of course Sofia's journey to finding, or not, a man is a large part of the novel). Instead, the best bit (not that I don't love the romance, or lack thereof sometimes) of the book is the relationship Sofia has with her family - mum, dad and sister Maria - and her best friends - Hannah, Foz and Suj. Every scene involving Sofia's family and friends is infused with warmth (even the desperately sad ones), which makes the novel a joy to read. From the scenes with Sofia's mum and dad bickering to Foz, Suj and Sofia giving Hannah advice about whether or not to marry a man who already has a wife (! ), Sofia Khan is Not Obliged is full of moments we can all relate to (ok, maybe the married man not so much, but we've all definitely given friends advice about love). That Sofia Khan is Not Obliged has a Muslim protagonist is unusual, but it's not weird. Sofia is likeable, mouthy, she swears, she procrastinates, she is, in essence, just like any other 30-year-old woman looking for love in London. It's just that she wears a hijab and prays five times a day as well. Malik is brilliant at folding Sofia's religion into her everyday life and making it completely normal, thereby avoiding turning Sofia Khan is Not Obliged into an issue book. It's refreshing to see something like Sofia Khan is Not Obliged being published - books giving a slightly different perspective on life but showing how alike people of different religions and ethnicities are in their experiences. More importantly, it's great to read something as witty and fun and human as Sofia Khan is Not Obliged. How I got this book: From the publisher, twenty7. This did not affect my review. 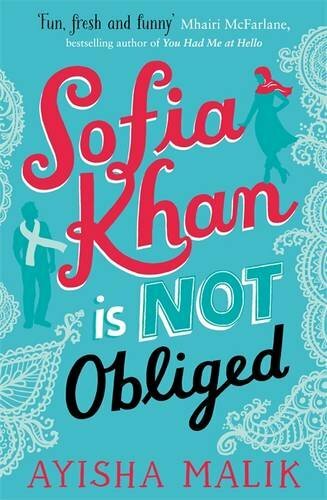 •Sofia Khan is Not Obliged is released in paperback in the UK on January 16, 2016.